Home » Reviews & Articles » Hardware » Team Group DELTA R RGB SSD Review – Has This RGB Thing Gone Too Far? There are many RGB SSD’s showing up on the market but the TForce Delta R RGB SSD is the first to come across our bench. Love it or hate it RGB is only getting more prevalent. RGB started getting into PCs as lighting swapped from cold cathodes to LED strips. Soon came standard 5050 style RGB strips which used an external remote to control them. Then we got into motherboard headers and other devices controlling these single color strips. Fans of course got in on the action soon enough with their own independent controllers. Then addressable RGB entered the scene, while addressable RGB has been around with specialty lighting and devices it was far from mainstream. A new generation of addressable products started to arrive. From multi mode fans from the likes of industry veterans such as Corsair to a lot of offshoot brands looking to cash in on the new trend. At this point I cannot think of many parts that RGB has not touched, and one which I never would have thought of is the SSD. since many PC cases now have ways to display your 2.5″ SSD, it only stands to logic that SSD would be a natural inclusion but it is one of the last parts I can think of to get the RGB treatment. 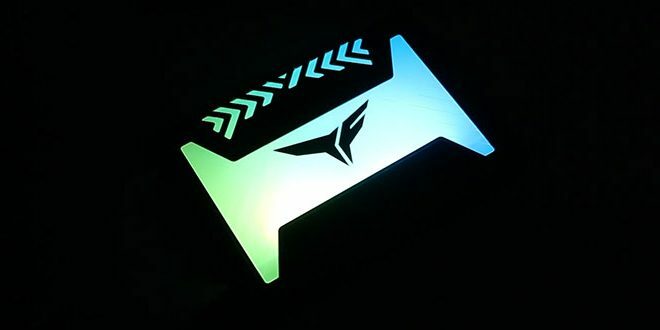 The TForce Delta R RGB SSD is the exact model we have in hand today. The reason I mention this is that Team Group has three total models in their RGB capable SSD units. 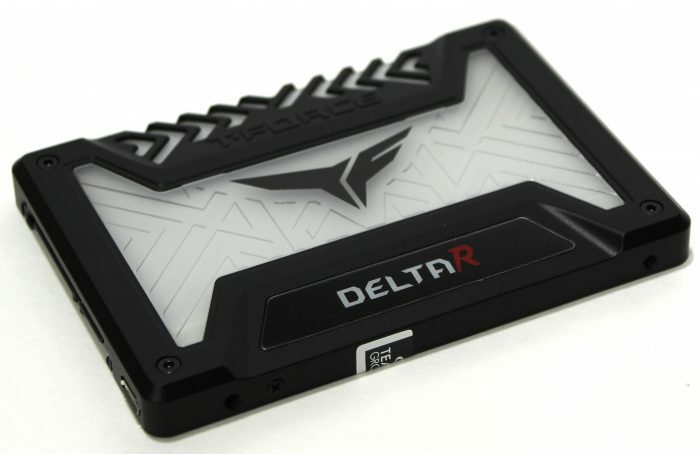 This price point puts The TForce Delta R RGB SSD 7 dollars more than one of the most popular SATA SSDs on the market at the same capacity. The Samsung 860 EVO is presently sitting in the $52.99 at Amazon and this is mentioned to give a understanding of what you are paying extra for the RGB effect. This is a very strange one as I came to find out that the RGB cannot be adjusted or controlled. It is a constantly flowing rainbow pattern. This is a bit thicker than the 7mm parts we see that can fit in and ultra thin notebook, but being RGB its not made for that. Decent warranty, matches the gamer series form Kingston, while Samsung offers 5 yr or 150TBW whichever comes first. Team Group made an interesting inclusion into the SSD market with a RGB SSD which offers a unique color flow and good performance.